It may prove a turning point or merely a temporary reprieve, but Romelu Lukaku�s 91st-minute equaliser against West Ham United felt like victory to Roberto Martínez. With good reason. Everton were staring at a potent combination of an eighth defeat in 10 matches, an early Cup exit and another round of scrutiny on their drained manager and then his £28m record signing halted the rot. �It would have been a horrendous setback but the players showed they are ready to fight for everything,� said a relieved Everton manager. By comparison with last season, Everton�s flaws were again glaring and the panic that spread around Goodison Park following Lukaku�s leveller betrayed the lack of confidence in the team. By comparison with recent displays, however, and the four consecutive league defeats that have soured Everton�s season, the fight and the first-half creativity was a reassuring step forward for Martínez. This was not a side refusing to play for the manager. The home side created the clearer chances but with West Ham pushing for victory throughout and Stewart Downing often dictating play from central midfield, the teams produced an open, flowing cup tie. Injuries to Andy Carroll and Diafra Sakho, who will miss the Africa Cup of Nations with a back injury, deprived Allardyce�s team of the presence to punish a nervous Everton defence. Instead, in Lukaku, it was Everton who had a powerful centre-forward able to unsettle defenders and bring others into play. Both sides threatened before the interval but Everton had the clearer openings through Lukaku and Steven Naismith, the pair just missing Adrián�s left-hand post. They continued to trade shots after the restart, Kevin Mirallas lobbing over from Naismith�s flick-on and Carl Jenkinson forcing Joel Robles to save at his near post. Downing went close with a right-foot drive that deflected out for a corner off the head of Sylvain Distin. It was returned with devastating effect. Morgan Amalfitano crossed to the near post and Collins, having lost Distin at the start of his run from the penalty spot, arrived in-between Naismith and Muhamed Besic to steer a bullet header beyond Robles. 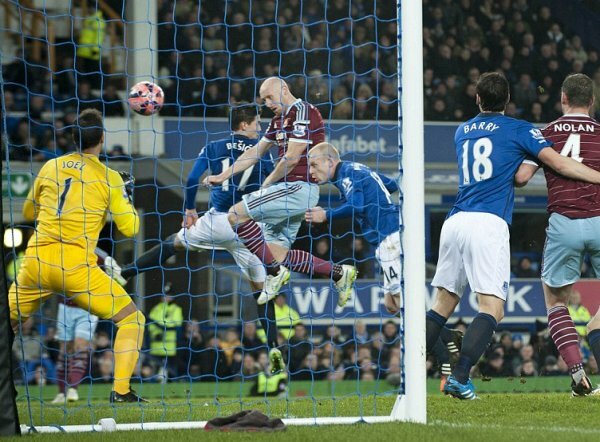 West Ham almost doubled their advantage from another corner seconds later. This time, from the left, the visitors worked the ball short to Mark Noble who floated an inviting cross on to the head of Enner Valencia. Robles thwarted the Ecuador striker at point-blank range. �He should have scored and it would have been too much for Everton to come back from that,� said Allardyce, who will have Alex Song available for next Tuesday�s replay after the midfielder announced his retirement from international duty with Cameroon on Tuesday. Martínez concurred. �That save could be a big turning point in our season,� he said. The Everton response was led, inevitably, by Lukaku. But with quality in short supply around him, his tireless efforts appeared to be in vain until stoppage time. The substitute Aiden McGeady released Bryan Oviedo down the left and the Costa Rican�s cross fell to the man of the match who made no mistake at the back post, sparking a jubilant celebration from his manager on the touchline.